The Fit Londoner: Can you train for an Ironman with only £1000 to spend on ALL the gear? Triathlon is well known as being one of the most expensive sporting habits to have out there. Combining the costs of swimming, cycling and running, it all racks up. And well, the longer the distance, the more money is spent on gear. With Ironman and other iron distance triathlons, besides it all culminating in a very long day out and the hours spent training for it, many choose not to do it because of the costs. I'm not going to lie - Ironman UK was expensive. But I want to show you that an Ironman or other iron distance event is possible by spending less than £1000 on gear, with tips on how to spend less. Saving up for a property at the same time as training for Ironman UK was hard work as well as managing expenses for general life. Knowing what my monthly expenses were was a starting point and how much I wanted to save up for the property. I love a good old spreadsheet, so popped these into it on a monthly basis and then I knew how much money I had to play with for Ironman training the following month. It's generally a good exercise to do because you can see where you're spending unnecessarily; there were times I was buying breakfast at work and once I realised the expenses coming out for this, I'd hold back and remember to bring my own. I'm writing this because with all the high tech gear around, people can feel either feel pressurised into buying it all or feel that the only way to complete an Ironman is by spending all the big bucks. And that in turn can put people off doing an Ironman or iron distance event. But hey, if you do want to spend the money on all the gizmos then that's fine. But remember to work on you, the engine. Don't buy the more expensive gear as a tool for reliance: use them to consolidate and enhance your performance. In November, because I was starting out Ironman training with literally no gear for cycling and swimming (remember, I had never done a triathlon before, nor did I swim much or even cycle) so I was pretty much buying everything I needed from scratch. Having a list of all the gear I would need for race day was my starting point. Now, obviously, buying all that gear at one go comes with a pretty hefty price - so I spread the costs over the training and I did this by writing a list of what wold be the most appropriate gear to buy each month. For example, a wetsuit in December was pointless for me to buy then - even though November/December/January can be quite cheap as people sell off their old wetsuits and save up for the new season wetsuits - because I wasn't going to be swimming in open water until March or April. So how did I fare with splashing out on gear for Ironman UK and did I spend less than £1000 on gear? Goggles: Clear goggles from Decathlon. Aesthetically, they looked horrible on me, but they were fine throughout my entire Ironman training and worked fine in the pool. Cheap as chips, but function over design. Don't look down at Decathlon - the quality of their products is fairly good for their prices. I bought most of my winter cycling kit from Decathlon and found them better than some of the higher priced brands: £6.99. Goggles: Polarised googles from Zoggs. I carried two pairs with me on Ironman just in case. The polarised goggles were brilliant throughout my open water swimming. I made the mistake of wearing them during a pool session though - I don't think they're meant to be worn indoors and I ended up with a headache afterwards! But otherwise, they were fine for all types of weather during open water swimming: £24.50. Sports bra: Free - I own hundreds already. BodyGlide: I don't know about anyone else, but I found Bodyglide so overpriced and it never worked wonders for me like it seems to do for most people. I bought one tube and only used it throughout training because I couldn't return it after use: £10.90. Trisuit: So I know the one I wore on race day was a bit pricey (I fell in love with it and it is one purchase I don't regret!) but my back up trisuit was equally a good choice and I wore it at Grafman Middle Distance Tri. My back up was from Sundried and was pretty good value for what it was worth: £34.50. FYI, Sundried have ambassadors who provide discount codes which can reduce the price more. Look them up on Instagram. 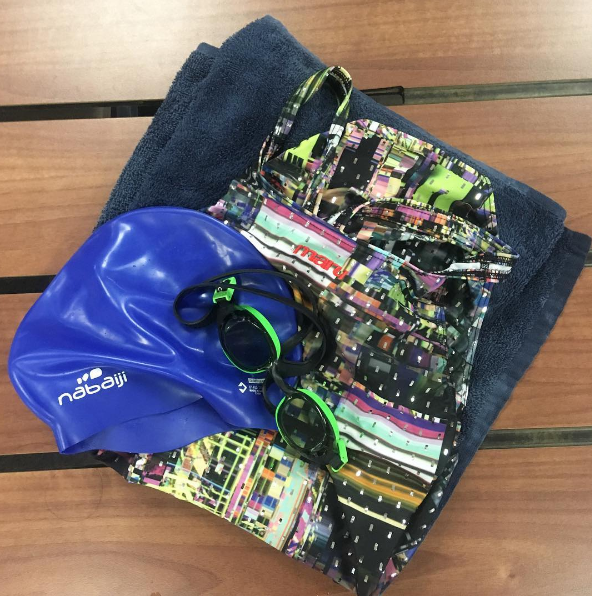 Wetsuit: The wetsuit is the priciest part of swimming. And when it comes to choosing what to buy - it's a whole world in itself: short sleeves, sleeveless, long sleeves, high neck, low neck, front zip, back zip, buoyancy - there's so much to look into. Sales are a good time to buy them around the end of season when they are trying to get rid of stock for the new ones. Second hand wetsuits are also easy to buy throughout the year (Facebook groups, Ebay and your tri club are some of the best places). If you can, try different brands and different wetsuits before you buy one - I found certain brands didn't fit me as well as others. I bought my orca wetsuit on sale at the triathlon-focussed branch of Cycle Surgery: £90. Paddles and swim buoy: All bought from Ebay: £25. This was always going to be the priciest one. The one where I'd gulp and pull my hair out each month. The gear for this is never ending. Now I'm no longer training for Ironman, I'm saving up for some nice new wheels because I can't get a new bike for now so will have to just focus on upgrading parts of Bertie instead so that if and when I do another Ironman, Bertie will be much, much better. Helmet: The helmet has served me well and I wore it up to Ironman. I now feel like I look like a 12 year old when I wear it so I'm going to keep it for my commute rides and buy another sleeker looking, more aero helmet. From Decathlon: £30. Cycling shoes: If you're buying your first pair, as I was, I'd suggest trying on as many different ones. I have a huge feet (men's size 9) so women's shoes didn't fit me and men's shoes were often either too big or small. When you do find the pair that fit you, see if you can find them on Ebay, Gumtree, Facebook groups or your tri club for a cheaper pair, or look around different store to see if they sell it cheaper. This is the same for most of the other items here. I bought mine on sale and this is a similar pair here: £90. Garmin watch and heart rate monitor: of course I wanted a high-tech Garmin watch but budgets meant this was a no-no. I ended up buying the Garmin 910XT watch and it served me fine throughout Ironman training and the battery lasted throughout the entire Ironman race. It does feel a bit old school, but then it is an old watch so what do you expect? The heart rate monitor came with my watch. I'm not a fan of the Garmin HRM - it kept slipping down my chest especially on runs, even at the tightest setting. Also watch out that Garmin does two different HRMs - one is waterproof that you can wear at swimming and they do one that isn't (the one I had). Second hand watches are very easy to buy on Facebook, Gumtree, Ebay and your tri club: £90. Garmin Edge 820: This wasn't the best purchase I made. I experienced so many problems with it throughout Ironman training. Battery life was poor - it would often die 2 hours into a long bike ride. The night before Ironman UK, it stopped working altogether. I have heard lots of good things about the Wahoo Element Bolt and will probably buy that. I got mine from Ebay but you can buy from here: £90. Garmin speed and cadence sensor: This came off my bike after two months of using it, so it's the worst purchase for me. Not sure if it was put on properly or if it generally just wasn't a great product (though I had asked someone to check it for me after I put it on). I bought mine from Ebay but you can buy form Wiggle: £40. Race belt: £8. There are much cheaper ones. I bought mine because I rememebr the day before Grafman that I didn't have one and it was the only race belt in stock. It's a good belt though and has sections for gels, which some basic race belts include. I got mine from Cycling Surgery. Bike: I reaaaaally wanted either a Liv Avow, Specialized or Canyon. But the Liv bikes didn't fit me well and the other two were well out off my budget. You can buy some really good bikes secondhand, but as I was new to the cycling world, I didn't really know how to inspect a bike and what to look out for. I ended up looking through bikes on sale. This is mine at Rutland Cycling though I bought mine at a lower price: £345. Since I wore a trisuit, I didn't need any additional clothes. Coming from a running background, I also owned almost everything for it. Lock laces: There are cheaper ones out there, but I'd been recommended these. These have been one of the best hacks I discovered and have bought another one for my trail and obstacle course race shoes. £8. Total cost for running: £8. Transition bag: I bought mine from Gumtree. I managed to fit my entire kit for Ironman in this bag (except top tube bag and bike!) as well as all my non-lycra essentials for the 4 days I was away for Bolton. Best secondhand purchase I made. £20. The total cost of all the gear I needed for Ironman training and race day came to a total of £936.16. Yes, I didn't go high-tech with all my gear but I had a budget to stick to and this provided me with everything I needed. It's also provided me with a solid base of gear for if and when I do another Ironman. So can you train and race for an Ironman by spending less than £1000 on gear?